When you dial 9-1-1, your call is answered by the Oglesby Police Department. We are equipped to handle both “Land-line” and “Wireless” phone calls. Our 911 enhanced system automatically prints the address and telephone number from where you are calling onto the dispatcher’s screen. In the case of wireless calls, the software can pinpoint your location to a distance of approximately 20 feet. Citizens with hearing and speech impairments can directly reach 9-1-1 through a TDD answering service installed into the E9-1-1 software. State location of the incident and the the problem or emergency. The dispatcher will start the appropriate fire department or law enforcement agency en route while obtaining any additional information. If it is safe to do so, stay on the phone until the dispatcher is finished determining the nature of your emergency and until you are told to hang up. Remember to speak slowly and clearly so the dispatcher can get the correct information. What is 911 Emergency System? •The United States has decided to use the telephone number 911 for emergency response services. This number may be dialed for free from any telephone when an emergency response is required. •To report unusual or criminal activity (e.g. alarms, gun shots fired, shouts for help, sounds of glass breaking, unfamiliar persons carrying items from a house). • To report situations that are not of a police, fire, or medical nature. 9-1-1 calls are answered 6-12 seconds after you call. In some cases there is about 5-6 seconds of silence on your phone before you hear someone answer—DO NOT HANG UP. If you do not speak English it is important that you tell the 9-1-1 operator what language you speak. The way that 9-1-1 telephone operators help people who don’t speak English is done differently in different parts of the United States. A translator may be brought on the line or you may be asked if you are with someone who speaks English. The goal is to get help to you as quickly as possible. Learning a few English words such as “police”, “fire” and “sick” can help. 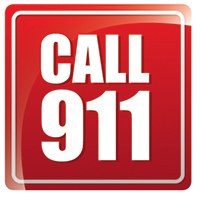 The 9-1-1 operator is required to ask a number of questions to understand the situation and where it is happening. Some of the questions may seem unnecessary, but they are important to make sure that the emergency is clearly understood This will help make sure the needed help (firefighters, police, ambulance or others) gets to the right place as quickly as possible. Stay on the telephone for as long as you can to guide the operator in getting help to you.